Just a few days to go and its neck-and-neck in both the try and tackle of the year votes! Its between Sasha or Natalie (though with Katie coming up on the rails) for the tackle, and Jess or Katie for the try. Incidentally there has been some - how can I put it? - very enthusiastic - voting in some parts, especially for the try of the year so I have taken the liberty of resetting things to more managable (not to say realistic) levels. Also, as we enter the final straight, you can also now only vote once - so drop by one final time and think carefully before deciding on whichever of the current leaders you'd like to lend your final support to. Nothing may be happening on the field other than the grass growing, but behind the scenes things are ticking along. First - there is a slight chance (and at this stage it is slight, but not impossible) that you could all be cinema stars - at the Broadway at least. On the off chance I wrote to them to see if The Film could be shown there (or at least a cut down version) in the advert bit before the main feature. And - to my slight surprise actually - they said, in principle, yes it could. It would have to get a certificate from the British Board of Film Classification (anyone care to guess what it might be, considering the high body count?) and converted to actual film first - two not insignificant hurdles - but time to practice those autographs and invest in some dark glasses, maybe? ...with more to come - plus potentially a good clutch of tournaments that could well include Regional 10s (October 7th), Rochford 10s (October 14th), National 10s (October 28th); National Cup (February 24th); Worthing 10s (May 4th); Dorking 7s/10s (May 11th); Herts 7s (May 18th); and National 7s (May 25th). Throw in half a dozen county weekends, about eight regional weekend, plus a tour and its already looking like a season to rival last year for the u18s (certainly a much better balance of home and away), and something rather better than last year for the U15s. And the final thing is that Katie says that trainng may start earlier as Simon may have a prior engagement on the 19th August - so watch this space. Admittedly there is nothing to stop training that Sunday anyway even if Simon is away - Joe will still be around (and Nim too...). Oh - and speaking of Katie - can she do the double on the try and tackle of the year (below)? She's leading both at the minute (just) - but have you voted yet? Only one week to go! You turn up and train midweek, you play games Sundays. Beyond that - who cares - does it matter how the game is run or who by? Actually, in truth, it does. The fact that the RFUW and the RFU are separate bodies running their own game really does impact at ground level. It means, for example, that there is no obligation for counties to support girls or womens rugby because the counties are RFU bodies. Fortunately most are rather more far-sighted than that, and we are okay in Hertfordshire, but there are players in parts of the North East and South West are not so lucky. It means that funding and sponsorship to the game as a whole does not necessarily and automatically find its way to the girls and womens game, it means that television contracts (for example) will only cover male internationals. It means - ultmately - that we have "rugby" and "women's rugby" as if they were different things. It need not be so, and from the end of August in Wales at least it won't be as the Welsh Rugby Union and the Welsh Women’s Rugby Union are merging - which means that the WWRU will no longer be merely an "associate member" of the WRU, but instead that the WRU will take on full responsibilty for the development of the women's and girls' game. So - in theory at least - any development programme in Wales will now automatically include women and girls, and it will be interesting to see whether the men's international team sponsors names start appearing on women's shirts. That is what happened some ten years ago when the men's and women's boards merged in cricket. National team sponsorship immediately applied to women's teams as well, and TV contracts included an obligation to show at least some women's games. As a result every county now fields a women's team stronger than the regional teams that existed ten years ago. Even club funding became dependent on programmes to develop the women's game. Admittedly mergers do not guarantee success - only two days before the above announcement one of the New Zealand "Black Ferns" was complaining about the lack of support they get from the NZRU, which they are full members of. And this is not the first time the World Champions have had cause for complaint. But overall the impression you get is that being part of a single governing body measurably benefits the women's game - look at the USA and Canada, where women's rugby has been a full part of their rugby unions for ten years or more. Remember how much girls' rugby is played around where IE Weldon came from, and - perhaps even more importantly - the positive attitudes there seemed to be towards it. Or maybe it would be better to say the lack of attitude - it was the routine acceptance of the women's game that was so impressive, the impression that every school that had a boys rugby team would of course have a girls team too. It barely needs saying how far we are from that! 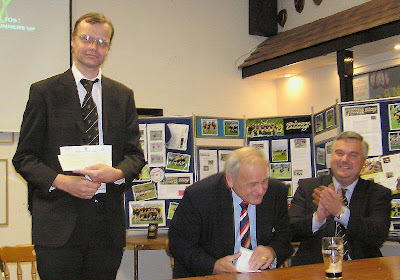 The RFUW and RFU have been in discussion for some years, I gather, but niggling differences remain. One day a merger will come, though, but in the meanwhile its going to be interesting to see how things develop over the border. Maybe it will take a revialised, well supported Welsh team beating England (something that has never happened in over 20 years!) before bullet is finally bitten? Try of the season - vote now! The highlights video contains around 20 tries - but what is the best? 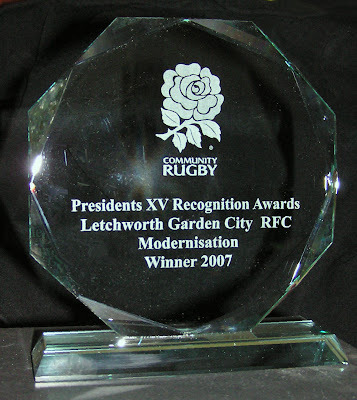 What was the Letchworth "Try of the Season"? I've been through the video as it appears on the website and picked a top ten - and I actually struggled to get it down to ten so apologise for any I missed out, but it had to be brought down to a reasonable number! The list includes the timing on the video for the start of each try - so you can jump to the right one easily. Vote in the usual way below. I have set it up so that you can vote more than once, just in case you have more than one favourite or several people want to vote - but don't go mad or I'll just start the poll again! Poll closes in two weeks. Visitors welcome to vote as well! Tackle of the season - choose the best! This one is even more difficult - so many classics! Nim's tackles, for instance, are so perfect she makes it look easy - a tackling textbook every one is a masterclass. But I couldn't pick just Nim - especially with some of the other spectacular ones on show. I tried to get this down to about 10 again... but couldn't separate these 11. That's you job! Voting as for the Try of the Season (above). Tension and excitment must be mounting in the Guilder household with the news the Hayley is through to the final 50 girls competing for next years RFUW U18 "Training Talent Development Group" (TDGs) . The TDG is more than yet another incomprehensible RFUW acronym (but doesn't that organisation just love jargon and opaque initialisms?). This is a very special training group - indeed in any other sport, or any other country, it would be hailed as the National Training Squad, and appropriate national appellation applied. However the RFUW bans us from using the word "England" in connection with it (you get Phone Calls should you dare to use the "E" word in print). Basically the TDG squad contains the top 30 girls in the country, selected by the RFUW national coaches - effectively the players most likely to play for their country in the next five year or so. Sasha was a member last season, along with a few other names some of your will know such as Megan Williams and Hannah Gallagher (from Welwyn), and Lizell Heather (from Kettering). Anyway - Hayley will now be up against Sasha, Megan, Hannah, Lizell and 45 other highly talented girls from across the country competing for those 30 places in the 07/08 TDG when she returns to Heythrop in Oxfordshire for a two day training and selection "camp" in just seven days time. If you would like to have your own copy of the full quality (and slightly longer) DVD version, contact Mike Alcock who has lots of free copies to give away to members of Letchworth Rugby Club, and to local schools and sporting clubs. Other people/organisations outside the local area will be asked to pay £1 to cover production & packaging costs. The video includes action from matches against Ampthill, Basford, Diss, Dorking, East Furries, Exeter Saracens, Havant, IE Weldon College, Kettering, Liskeard-Looe, Milton Keynes, Paviors, Rochford Hundreds, Saracens, Sudbury, Vampyres & Westcliff in the Beckenham Festival, the Rochford 10s tournament, the Herts 7s, RFUW East Midland 10s, the RFUW National 7s and friendly matches through the season. 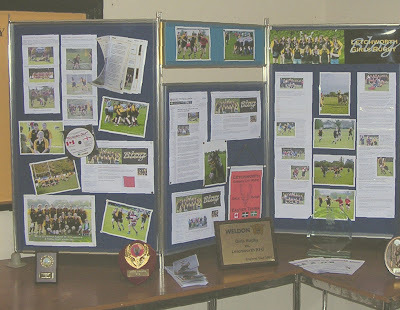 As you see, I've now made the image to the right into a sort-of "slideshow", illustrating both U14s and U17s (and even U11s!). What do you think? The selection of pictures is a bit random - but fairly easy to change. Any suggestions/contributions of better images (and especially of the younger girls) would be appreciated. As you will have see above, Mike has also produced a web-version of The Video. To make this be easily on a permenant basis a copy has also been placed on the sidebar (note that the quality of the full DVD is much better - and a few minutes longer!). By the way - if anyone can suggest where we might, now or in the future, be able to put better quality versions of the videos (YouTube limits length and file size, so if you go full screen its a bit blocky) we'd like to know. Basically we want to retain full copyright control (so Google Video is out, for instance) and ideally it should be free! Incidentally, while on the subject of (alleged) "rugby ads" there is also this little "classic" which some may have seen before. What they were trying to advertise isn't revealed... another AS level project maybe? Katie has just set off on a 'Music Tour' around Paris including a visit to Euro Disney to 'play' there. Whether we are talking about playing music or playing on the various attractions is, of course, another matter but I am pretty sure that, on this occasion, it's not playing rugby! "In March 2004 I wasn't a sporty person. 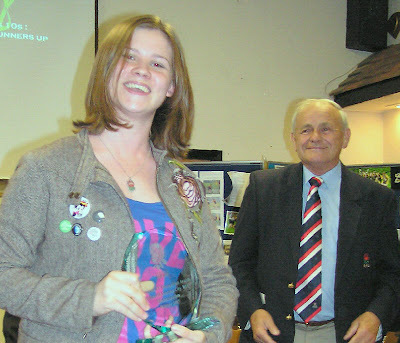 I definitely wasn't a rugby player. In fact, I'm not even sure that I knew women's rugby existed. I was the kind of person who always got level 4s in P.E. when everyone else was getting level 6s. I was short, I wore glasses, I had terrible hand-eye coordination and I took a long time to get changed! By the time I finally got out onto the pitch, I just wasn't any good. I tried my little heart out but I just couldn't do sport. Rugby changed all that. This isn't true of everyone here at Letchworth - some of the girls are born sportswomen; for some sport is their life, for others it's their hobby. We have tall girls, short girls, big girls, small girls, girls who dress differently, like different music, come from different towns and have different friends. Through rugby, I have met people from as far away as Canada and been on tour with people whom, without rugby, I probably would never have met, let alone talked to. And rugby has given us here something much more than friendship, we are a team and we support one another. If I'm having a bad time at the bottom of a ruck, I know one of these girls will come and help me; if I'm injured or I've been fouled, I know someone will be there to pull me up and, if I make a bad decision out there (which I admit happens sometimes! ), I know that one of these guys will be there to pat me on the back and tell me to forget about it. When John first mentioned his blog idea, I suppose I thought the same as everyone else - great; no more having to store a screwed up newsletter in my kit bag and hope it doesn't get too muddy; no more texting people the night before a match to say, "Please say you were listening at training because I can't remember what time to meet!" but in reality the blog has become so much more than that. I mean, yes, we do get our information, dates and times, maps and directions, but we get much more than that, too. There are bits full of nostalgia and comedy, articles which have nothing to do with rugby and some which have everything to do with rugby, not just for us girls but for boys, men and women, too; and not just in Letchworth but around the world. The blog gets over 2000 hits a month and has global recognition; people comment on it, contribute to discussions, advise us and congratulate us - what we've created is no longer merely a means of online communication; it's an online community in itself. And that's what rugby is - a community - and it changes people. It's changed me. That little girl who first came here to Letchworth Rugby Club in March 2004 holding her Dad's hand and looking scared is a completely different person from the one standing before you. I'm still short, I still wear glasses and I'm never exactly going to be Miss Sportswoman of the Year, but I can now consider myself a sporty person. I wear my rugby shirts to school with pride and bore my mates to death with blow-by-blow accounts of the last match, I've learned not to judge people by what they look like and have been taught how to communicate with people from all walks of life, all cultures and all cliques. I've become a person who is confident in herself, confident enough to stand up and talk to a room full of people. Rugby gave me that. I even learned to be confident enough to approach MPs ...... which leads me on, conveniently, to our next speaker - our local MP, Mr Oliver Heald." Hayley G flew the flag for Letchworth today as our only representative at the RFUW's "High Performance Academy" (or HPA) - essentially a trial for the 2007/8 TDGs [the "elite" group of c30 girls given extra training by RFUW's leading coaches - Sasha was one last season]. So - making the ultimate sacrifice by missing Day Two of Rhythms of the World - it was off to palatial surroundings of Heytrop County Club near Chipping Norton in Oxfordshire. All manicured lawns, box hedges, 440+ acres, and hordes of Spanish language students sulkily sitting on the touchline because they couldn't play football. The top girls from East, South East, South and Thames Valley who had not been in last year's TDG attended - about 30 in all - which promoted several parents to give an impromtu performance of what sounded to some of us like something vaguely reminiscent of the Four Yorkshiremen sketch ("You started at 8am? All right f'some . We'd be on t'road for an hour by then!". "A hour? You were lucky. By then we'd been driving so long that when we left my daughter was still a U14!". "U14, by 'eck by our daughter hadn't even bin born when we first climbed into t'car..."). Anyway, despite being drugged up to the eyeballs to keep her tonsillitus at bay and then injuring her hand again early on, Hayley seemed to cope well with some good breaks and a few typical tackles. Was well enough? We shall hear more this week - but its a tough call as RFUW will be only selecting about 20 girls from over 100 trialling at three centres this weekend. Some clubs have already started training. However, in the best traditions of North Hertfordshire sport (its just a bit too keen, isn't it?) we are having none of that. I mean, we have certain standards here. At Letchworth we firmly believe in honouring the traditions of the game - best exemplified by the U17s visit to Westcliff last season. Which many will remember. Okay I appreciate that some of you probably don't remember - even though you may have played in the game - but Mike has the film should you need to fill in the memory gap. Anyway we don't expect to see anyone of you for the better part of five weeks - but what will you do in that time? How will your rugby starved minds cope? Well, there are the many websites mentioned herein in recent months - and Total Flanker certainly gets better and better - and to this list I would also like to draw you attention to The East Terrace. This impressive - and really very funny - website has been going for some time, but had appeared to have died until recently, which is why I've not mentioned it before, However, it has suddenly woken up again with articles on the Worst Rugby Kit in History (though how anyone could hope to beat kits East Terrace have highlighted in the past, like Stade Francais and Calvissano I am not sure), gives illustrated guidance on how to celebrate a try (including memorable film of how not to score one) and more besides. Well worth a look. 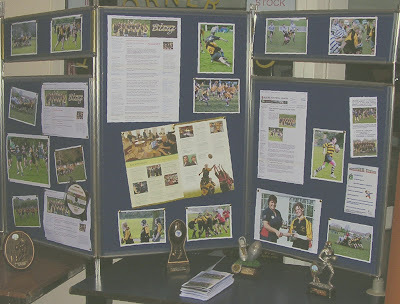 Welcome to the world of the rugby blog to the boys of Letchworth RFC or, more specifically the boys U14s (well, they'll be U15s next season). If you are wondering "who" then basically its Dave Sharp's Phil Waters's lads - the ones who went to Aberystwyth and apparently also won the odd trophy or two last year. Yes - for those who recall the main junior presentations back in April - them. The boys' blog is under the creative management of Jonny Wheeler and Lewis Waters and fetchingly designed around the club colours. As Katie said last night, just occasionally this blog features something that has nothing to do with Letchworth, Hertfordshire, East Region - or even women's or girls' rugby at all. This is because on rare occasions I occasionally come across something of such significance that I feel it should be shared widely. And this is one of those moments. Training will begin on Sunday 19th August starting at 10.30. We know that some people will be away (chances are I will be) but we need to start early with the first county day being 9th September. Midweek training looks like being Thursdays, for all the reasons discussed - ie. principally the availability of pitches and coaches, but also concerns about Tuesday being too close to the previous Sunday. Timings may be earlier as well - 6.00 to 7.30 was what was being discussed - as that will give us full access to the whole pitch before the 1st and 3rd XVs start their sessions. We know that this will not be convienient for everyone - but then no evening will be. If Thursdays really would be impossible let us know (email or comments) - until its gets dark in October we may be able to do other days. All ages will train at the same time, and - as much as possible - together. With three coaches there will be opportunities to take smaller or less experienced players aside when this is appropriate, but the difference in rules and tactics and such between U18 and U15 rugby next season will be minimal. It is also felt that U15s will benefit from working in a larger group, and also against larger (but not actually that much larger!) opponents. U12s will also be integrated into this as much as is feasible and appropriate. It is, however, probable that one coach will take responsibility for a particular age group - Simon for the U18s perhaps, Danni or Kirsten for the U15s/U12s - but we will see how that evolves. Anyway, comments welcome as usual. Hope that everyone enjoyed last night - and particular thanks to Neil for the food, and Mars and his staff for running the bar. The club promotional video went down well - hopefully Mike will produce web version shortly so it can go up on here. It certainly compared very well with the England videos that were shown earlier. Copies are available on request from Mike. Katie's speech also won rave reviews and - if she can remember what she said - could gain wide coverage as Amanda bate, the regional women's development manager, made a point of asking for a copy. Hopefully we'll get one or two pictures shortly - but for now thanks to everyone who came along! If you were trully desparate to play international rugby, where would you stand the greatest chance of pulling on a national shirt? Strangely enough it isn't Ireland after all (though their playing record does appear to be everything that I hear Sasha claimed it was) in fact somewhere rather more pleasent, climate-wise - and as its also a British colony language would not be a problem. So where do you go if you are hankering to be called an "international"? May I recommend the Cayman Islands. These dots on the map are in the western Atlantic, and better known for being a tax haven. But they do play rugby there. And women's rugby too. And they play internationals. Later this year they will be staging the third Caribbean Women's Rugby Championship there, building on their first international back in 2004 when they lost 15-3 to Jamaica. So why is this a good place to get a game? Because their coach mentioned in passing, after the Jamaican game, that one small challenge he faces is that he had a total of 17 players to select his team from. Yes - 17... ever so slightly fewer than England! So if you're anywhere near Grand Cayman between the 18th and 26th August drop by the Cayman Island RFU's offices in George Town. And don't forget your boots. Another country worth packing your boots if you are visiting may be Austria. Okay slightly more rugby there, but there is a glorious tale here (in English) about their national team going to play Hungary for a 10s game... in a 9 seat mini-bus... getting stuck in a traffic jam and pracising line-outs to pass the time... borrowing players when they got there... finding they didn't have enough shirts... plus some dodgy after-match entertainments (what, exactly, is a "popo"?). Yes - if you happened to be around its odds on that you too would have been singing the Austrian National Anthem that day - and having a damn good time by the sounds of it - especially as its also apparent that their age rules are ever so slightly more relaxed than those of the RFUW. BTW - the Austrians do a neat line in posters and leaflets - curiously quite a lot of it in English. A reminder about tomorrow's "event". First - if you are coming for the party please remember to bring £3 to help pay for the disco - pay on the door. Second - the bar will be open and standard licencing rules apply. You should know by now what that means. Doors open at 7.00 for the presentation at 7.30. Please arrive before 7.30 as we don't want anyone walking in halfway through. Highlights will include the new team "promotional video" that Mike has been working on, plus an exclusive viewing of some England motivational videos, as well as the President's XV trophy and cheque. Also the first chance to meet your new coaching team - Simon, Kirsten, and Danni (aka "Diddsy"). A sit down buffet from about 8.00. Details for the first big event of the new season have been confirmed. On Sunday 9th September there will be a County Day at Welwyn, starting at 2pm. What this will invove depends on which age group you are in. 9th September will be your County trial. The selectors will be picking about 40 girls who will go onto the next stage. Eventually they will be divided into two squads of 20 - a County Squad and a Barbarian (or "second team") squad - but that will not happened until after some further training sessions, probably in October. The trials are expected to be mainly based on performance in match situations - but the matches will not be based around club teams. For the U15s the day will be more of a development occasion to see how many girls are intersted in playing for the county, and what the standards are. A formal trial - if it is felt that one is needed - will take place at a later date. A "come and try it" U12 event is also planned - and this will be very much an afternoon where we will see what the numbers and interest is, as well as range of ability, before looking to the future. A good turnout will be important for all three age groups. Also dual qualified girls should remember that your options remain open until you actualy accept a selection into a formal county squad, so attending the event in Welwyn will not prevent you from also putting yourself forward elsewhere (unless they have trails on the same day, which in the case of East Midlands at least I would not expect). After missing out by half a point in 2005, and by one missed basket in 2006, one of our entries at Superteams finally came home with the title. Okay, strictly speaking, Herts Superteams isn't actually a rugby tournament. 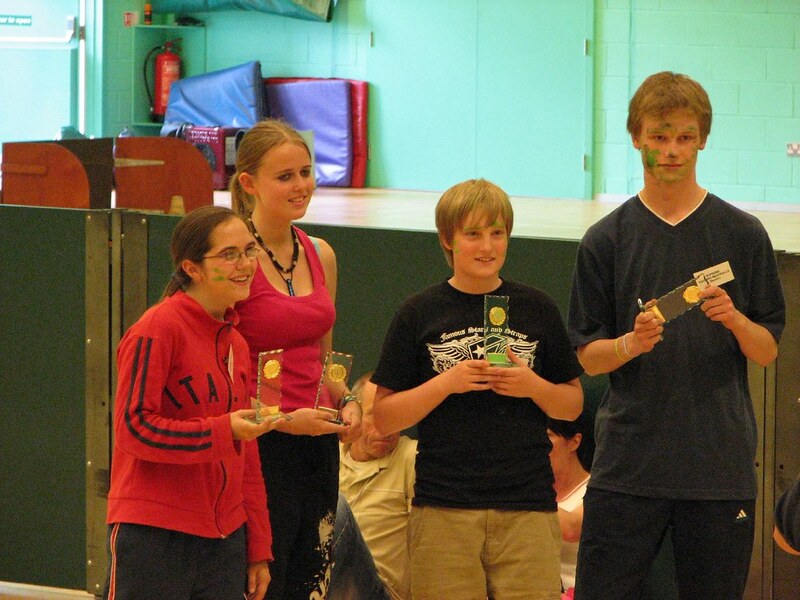 And strictly speaking half the winning team were, well, male (but the rules do say that teams have to be mixed). And strictly speaking Nichola and Mel probably won't be playing next year - but they were team and club members this year, and were entered under the club's banner (well, more or less) so I reckon it counts. It was actually quite an impressive all-round performance with wins in at least four events - two year's experience of the tournament being an important factor. The other U17 entry - including Hayley, Carla and Sasha - missed out on third place by a single point, having achieved a maximum score with the joker on the bungee run and also winning the rodeo bull - but missed out on points elsewhere. The U16 team lead by Jess (and shown here apparently playing four-a-side badminton) were more consistent and would have stolen a place had they not played their joker on hockey - and made a complete pig's ear of the event. In the U14 competition we saw the return of six of the girls from the North Herts tag team, and the younger they were the better they did. Hayley A's U14 combination only scored in hockey - but had the most memorable moment of the afternoon when Kieron managed to stay on the bull for the full minute. A U12 team with three of the older Year 6 girls form the tag scored in two events - basketball and bungee run - but otherwise missed out, but the youngest team lead by Kate Summerfield - effectively a U11 team - did well scoring in several events, especially those that majored in skill rather than strength. Unfortunately there were a few of the latter where they failed to score. And it was great to see the tag girls again - hopefully the core of Heather's U12 district team next season. Do you want to take your newly minted referee qualification a step further? The RFU and RFUW will also be holding its National Women’s Refereeing Conference on the 14th and 15th of July at the Staverton Conference Centre, near Daventry. Apparently last year was very good and this year it is promissed will be even better. The cost of the weekend is £30 (including all meals and overnight accommodation) and will include workshops around female specific fitness, nutrition, lines of running, controlling the game, psychology and much more. There is also a formal dinner for all delegates. I might add that Staverton is a seriously impressive centre. I've been there for a couple of RFUW things and its a really very nice hotel with accompanying sports facilities used by the RFU and RFUW for many its most high-powered events. Food is very good as well and £30 for a weekend there is very good value indeed. If you are interested in going please email David Rose on davidrose@rfu.com for more details - ideally as soon as possible. There is no bar on under 18s attending, though you are advised let David Rose how old you are (presumably for the usual child welfare reasons). Registration starts at 9.30, and the competition itself at 10.00, so ideally try to arrive between 9.30 and 9.45. Team Captains please ensure your team is registered whe you arrive. I may have to make two trips so probably will not be there are 9.30. The teams will probably be registered as "Letchworth girls rugby" A, B or C - if you want to negotiate a fancier team discuss this with the organisers - they will probably be okay with it so long as they haven't drawn up their scoresheets yet. It is in the main sports hall at the Sports Village where the Youth Games takes place. The event is free, but last year the sports centre were charging everyone £1 for entry to the centre. If you fancy a swim remember to bring your swimming kit (see below). Food and drink can be bought - but it will not be cheap so I suggest you bring your own. It can get very warm in the sports hall - bring plenty to drink. The swimming pool will probably be open, either free or for a small charge (£1 last year). There will be time to take advantage of it - its a good pool - and if it does get warm its a great way to cool off. The competition wil probably finish early - it has in the past two years. Work on the assumption of a 3pm finish. If parents are not staying please ensure that you children have your mobile phone numbers etc. Make sure you get all your team on time to each event - don't let them wander off (without telling you where they are going)!! Ensure the highest standards of sportsmanship... there are trophies and £250 up for grabs should you need an incentive! In this case we have possibly the first national RFU to adopt a blog as its main news medium - the Deutschen Rugby Frauen (DRF) - who launched their blog in April, and for some of the same reasons we started this (ie. its much easier to maintain than the "standard" website). Its worth highlighting for a number of reasons, not least of which is that women's rugby is a lot more widespread than you might think. Indeed according to the RFU at their exhibition last year women's rugby is played in at least 81 countries across the globe. It has to be said that in most of these countries the main format is 7-a-side rugby - indeed if you read around a bit you find that Germany came close to abandoning the 15-a-side game quite recently, and only changed their minds following protests. 15-a-side rugby is quite expensive to maintain for smaller nations, and also tend to result in teams like Germany getting a bit of a pummelling, whereas 7s does not generally result in 100-0 scorelines and also allows a country to play several other nations over a weekend.